If you don't know who she is, she is An AGtuber, and instagramer, who is extremely inspiring and famous! Sorry the image is so big! Heres a link to her channel! WATCH HER SHOWS I SWEAR YOU WILL LIKE THEM! Comment if you are a fan! Also comment your favorite show she makes! PS: SHE FOLLOWS ME ON INSTAGRAM !!!!!!!!!!! Hi! I'm Makenzie, But you can call me Kenzie! I love Jesus with all my heart, and strive to live like him each day. A joyful soul is the best soul. OH AGSMILESS CHECK HER OUT RIGHT NOW HER VIDEOS ARE PERFECTION! She's okay. I used to watch Aspen Hieghts but I don't anymore...she says too many bad words and takes the Lord's name in vain ALL the time. So, not a huge fan. I do not mean to offend anyone by what I'm saying. We all have our own opinions and this is mine. What is Aspen Heights about? It does, but I just like to ignore it. Its still good though! Its about a girl who goes to a boarding school, and she finds out shes an Aspen, Which is someone who has powers and all, you have to watch it. Its hard to explain. SHE IS SUBSCRIBED TO ME ON YOUTUBE. I love her! Yeah she does say O-M-G (you know) but I just ignore it. She can do that if she wants too, but I just know that I can be an example and a shining light to the world in my own videos by NOT using God's name in vain. I love Aspen Heights and can't wait until someone posts season 5 if she's come out with it yet since I can't browse YouTube. // WARFARE PROGRESS: Reoutlining it again. 5th draft here I come lol. SHE IS SUBSCRIBED TO ME ON YOUTUBE. I love her! Yeah she does say OMS (Oh My Stars! )(you know) but I just ignore it. She can do that if she wants too, but I just know that I can be an example and a shining light to the world in my own videos by NOT using God's name in vain. I love Aspen Heights and can't wait until someone posts season 5 if she's come out with it yet since I can't browse YouTube. That's AWESOME! She follows me on Instagram! I choose to ignore what she says too! But ASPEN HEIGHTS IS AWESOME! 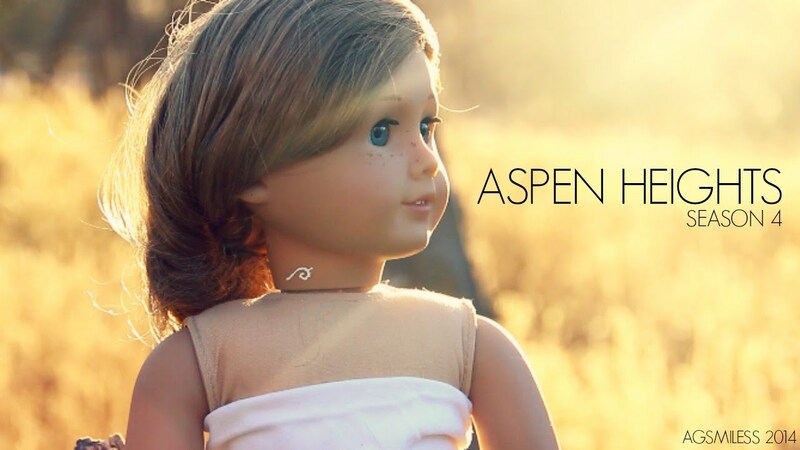 I was litterly absessed with Aspen Hightes the first 3 seasons then when the forth came I stopped watching it. But, I love watching 19 dolls and counting! I also love watching her P.O. box openings, I don't really know why... I usually think P.O. box openings are really boring. I’m a 12-year-old girl, and I am the youngest in the line of 4 girls. I adore writing and I hope to be an author when I’m older. I love American girl dolls, I actually have a blog for dolls! You will often find me reading, creating art, dressing my dolls, blogging, or doing just about anything outside. And I’m practically glued to my camera. You might wonder how I have time for all this; well, I’m home-schooled! I have never attended a day of school in a brick-and-motar school in my life (neither have any of my sisters). I often do math sitting with mom on my living room floor, read science curled up on the couch with my sister (and cool experiments in our kitchen), enjoy history with lunch most days, share writing and art at my co-op with friends, and lots of other fun subjects just about anywhere I can. I also love robotics! I competed in the World International Competition in Florida a few years ago and got to go to Legoland with my team and swam in the Gulf of Mexico! I just relocated to new England, where I’m discovering lots of cool creatures in my backyard. But the move has been a bit hard for me considering it is 7 hours away from all my bestest friends and family. But I’m getting used to it and have been making great friends here. Since the move I have learned many important things about friendship. Could someone post the first episode of 19 dolls and counting? Is it ok? Yep, here it is! And there's 4 mroe episodes already posted after this! Did you guys see AGsmiless is comming out with season 5 of Aspen Hieghts? Will you guys be watching it? And do you think I will need to have watched season 4 to get this upcoming season? Yes! I saw that! IM SO EXCITED!!!!!!!!!!!!!!!! Ok! I'll watch season 4 all tonight . I'm starting it RIGHT now! I kind like her videos! I don't mind that she says "OMS (Oh My Stars!)" though. Sometimes it could be "Oh my gosh!" I like 19 dolls and counting and aspen heights! Um the comment says "Oh my stars" which is clean.